Takemitsu’s lengthy title and piece were inspired by a dream he had when he was shown a photograph of Marcel Duchamp with a five pointed start shaved into his head, taken by Man Ray. As a contemporary composer, Takemitsu’s influences, composing style and the aesthetics of his work span across both a western and eastern aesthetic, and it is these two polarities he incorporates into his work. Using dream as an inspiration and varying pre-compositional processes, A Flock Descends becomes a blend of Japanese Traditional musical gestures and features using a western orchestra as well as its textural characteristics to create a piece he wanted to transcend the two aesthetics. Broken down, the title reveals the character of his piece. The flock suggests birds, movement, air, sparseness and space. Descending also betrays another aspect of the piece; its movement and motifs, though they build up, are still inclined to move in a downward motion and a decrease in timbre and texture. Pentagonal is probably the most interesting word in the title, as it dictated very much so Takemitsu’s composition and its harmonic series, as well as his rhythmic series, using the pentatonic scale and defining space. Garden acts as a metaphor, whilst not unheard of in his other pieces, and provides a showcase of the composer’s preferred view on texture. It conjures something lush and growing, but also importantly the idea of meditation, like the theme of the flock. Takemitsu concerned himself and a lot of his composing with the unfolding of his works through time. In A Flock Descends Into The Pentagonal Garden, these horizontal aspects of texture represent a Japanese garden as a metaphor; with the piece’s structure and orchestration representing fixed musical items, or trees and rocks in a garden. 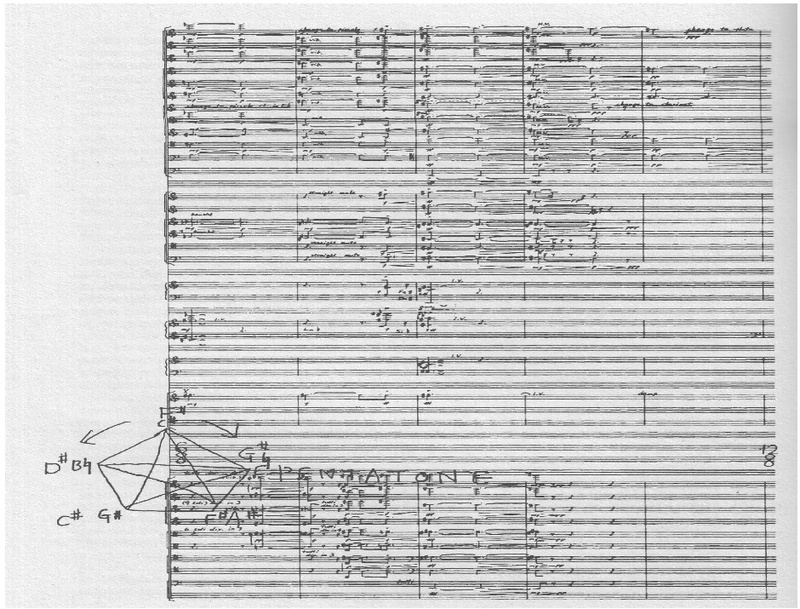 “…Wandering through a series of fixed musical objects’, some of which can be viewed in a different light, and some of which may be revisited…” (Burt, 2006), Takemitsu would concentrate more on how the piece would unfold during its playing. The garden isn’t the only theme in the piece; his ‘Dream and Number’ series has been inspired a lot by dreams and contemporary musical composition practises. A Flock Descends belongs to this series of works, where ‘Dream’ accounts for the source of inspiration and ‘Number’ refers to the pre-compositional processes undertaken dictating, particularly, the pitch. It is these metaphors that give the piece its transcendental feel and provokes an awareness of not just the immediate surroundings of the world, but also “…project the composer’s conception of time and eternity.”(Koozin, 1993). “You view a Japanese garden this way, circulating through it. It’s not a linear experience at all. It is circular…one always comes back. I write music by placing objects in my musical garden, just the way objects are placed in a Japanese garden…from gardens I’ve learnt the Japanese sense of timing and colour.”(Takemitsu, 1994). The piece starts with a definite sense of polyphony, where the melody or motif evolves in the flowing and distinct registers of the brass and strings sections. The two registers in the beginning of the piece provide, what sounds like, the sensation of a circling flock not quite having begun descent, the timbres of each having the ability to provide mild textural intensity filling the spaces of Takemitsu’s orchestra. Dynamics are explored throughout the piece in what sounds like precise sections or intervals of the piece’s duration. The oboe and the strings definitely express this sense of gliding, from texturally intense lows, most of the orchestra playing, and then the brass falling into the background as the wind instrument and its string accompaniment lessen the intensity of the group but at the same time provide a lulling timbre from the piece. Silence in Takemitsu’s A flock descends into the Pentagonal Garden though creating a dramatic, to say the least, contrast between its varying dynamic ups and downs, is also used as an instrument. This idea of silence doesn’t really occur to the listener until the orchestra comes in, and as such it perpetuates its own small sections in a comfortable hush. Still in the first quarter of the piece, the polyphonic melody represents the idea of the birds gliding down in a convoluted spiral to reach the pentagonal destination. The oboe, however, repeats and meditates on the single pitch C and moves up and down very slowly, exhibiting the theme of the flock. The black bird is an abstract in the piece. Where the oboe represents the theme of the flock, the central pitch of F sharp represents the black bird that Takemitsu dreamt of leading the flock. This is his favourite pitch, and what is interesting to note contextually is that though it is a pentatonic scale, the notes C sharp, E flat, F sharp, A flat and B flat are the make up for the traditional Japanese scale called yo. When asked about composition and his process, Takemitsu admittedly said he found it hard to write for allegro moderato, saying that it was the “…regular succession of a uniform series of attacks which defines the music’s rhythmic, harmonic, and melodic nature…”(Sherry, 2002). Takemitsu admits to using F sharp as his central pitch, saying that in German its sounds like ‘fis’ (sounds like fix) “…and with that intentional pun in mind, I use that F sharp as a fixed drone.” (Takemitsu n.d.). In doing this, Takemitsu can be seen to use the drone in two ways, “…attacking the same pitch-class throughout the section…” as well as using pedal points. This is an aspect of the piece that explores the western and eastern artistic traditions, and what’s interesting to note is the line he seems to draw between the two polar aesthetics within his work. The repeated attacking of the central pitch in sections and the pedal points shows the western “series of attacks” while he still actively maintains the eastern, drawn out shape and timbre of each note. The black note pentatonic scale featuring B sharp, E flat, F sharp (central pitch), A flat and B flat. “The idea of ma is very much like the idea of emptiness…in other words, until you have something in the space to define it, then it’s undefinable, it’s not there. So emptiness is not there until its antithesis is there…Toru certainly does this. And that defines the silence.”(Richie, 1994). The brass often prepares the next wave of Takemitsu’s dream piece, using it as a preparing roll and providing a certain boldness in orchestration and character to it. Just after halfway through the piece, Takemitsu idiosyncratically uses percussion to typically bestow melody rather than a sense of rhythm. The glockenspiel coupled with the plucked harp give this particular section of the piece not so much a sense of sparseness, but a rich, dream-like fleeting moment. The added playing of high register in the strings which sounds like it is trying their scales, also gives this section an eerie soaring feel, that one could say encapsulates appropriately the ‘dream’ aspect of A Flock’s inspiration. Though the piece based around his garden metaphor, it soon begins to be difficult to hear a prevalent concentration on the piece’s horizontal structure. One could say that many of the “fixed musical objects” are revisited and only few are “viewed in a different light”. One thing Takemitsu noticeably explores is pitch, and though his garden metaphor is something to note, one finds that the piece has a tendency to explore vertical structure just as much, maybe a bit more. Although, the two do seem to work in conjunction, the vertical forms of the pitches and the primary scale tend to combine the orchestra in “chromatic climaxes”, giving “sudden brief outbursts which immediately subside…”(Burt, 2006), giving the two textural realms equal exhibition. Takemitsu’s attitude regarding his sense of timbre is explored as well in the vertical texture of the piece and is “…reflected in his own composition, in which emphasis is not so much on the motion of tones but rather the motion within tone itself.”(Koozin, 1993). He’s definitely more aware or at least selectively chooses to concentrate more on the succession of the movement in the sound he’s trying to create, and to quote Koozin again, defines “…timbre as both spatial and temporal in nature…”. The main polyphony, one notices, is lost occasionally throughout the piece and takes on a sense more like that of biphony, creating a play between the strings and brass. The strings take the foreground, the brass having to keep quiet, and then taking more of a polyphonic counterpoint character. That, though it is more of a contemporarily pioneered aspect of texture, and the imitations as well as symmetries of varying louds and softs are exhibited again. However, this section has a tendency to hold on to the drone element given by the oboe and creates and demonstrates a merging of a very traditional Japanese musical gesture but also a contemporary and more universal one as well. The oboe is still playing in C and meditates on this pitch, sharing similarities with that of oriental music, and the idea of a counterpoint that can’t be coined by the general term ‘Western’ allows the piece to deliver something more of an extremely individual, but at the same time, mutual character. A sense of closure or resolution can be heard near the ending of the piece, with the orchestration of the trumpets and the glockenspiel again. Takemitsu continues to end the piece with levels of imitation and decoration from the beginning motif, but the brass and percussion prior to this adds a familiar character of warmth and ‘dreamy’ texture, almost as if the flock has finally perched within the pentagonal garden. 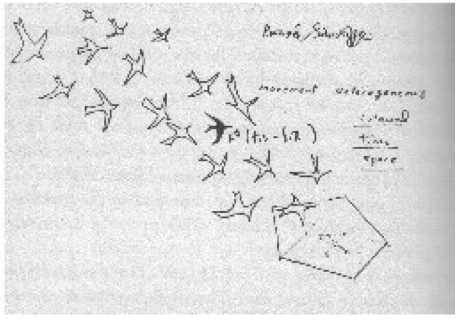 Takemitsu derived his basic pitch materials from a process using ‘magical squares’. “…Retaining F sharp as a ‘fixed pitch’, he subjected the remaining notes of the black note pentatonic scale to transposition operations by means of ‘magic squares’ to derive his basic harmonic fields of this work.”(Burt, 2006). However, one finds that many of the graphics and side notes scribbled on his score that he uses to illustrate this aspect of his music “…stand in a merely decorative relationship to the text…”. Example of the varying diagrams and sketches explaining his pitch derivations. He also used a ‘rhythmic construction series’ in which rows and columns added to the sum of fifteen, and derived the duration of the piece’s sections. In a sense, he has payed more attention than usual to duration here than he might usually, especially seeing as he is a composer more interested in the development of timbre and the single note, however, it’s an aspect of this piece exemplifying Takemitsu’s disinterest in rhythm and metric pulse. The text on the score fails to make mention of these rhythmic constructions, and as such, these general observations fall upon the work such that it suggests a piece not too concerned with rhythm. His background in traditional Japanese music like gagaku may have been determining factor in the work’s influence. The harmonic range of the sho scale has verticalised modal forms, an aspect that is not unfamiliar when listening to his music. Then again, the composer was extremely fond of western music, having grown up in the Japanese colony Manchuria in China; his parents played him many jazz records. “His parents’ constant rehearsal of his favourite ‘Dixieland, New Orleans Style’ discs…clearly left the most indelible impression on the fledgling composer…”(Burt, 2006), however, his father died when he was around the age of eight and he was sent to live with his uncle, whose wife taught the koto. This too must have had a deep impression on the young boy. By 1944 he had been exposed to much western music, and during a period of time when he was ill, he would listen to the radio for hours on end, cultivating as much of the western aesthetic he could. It’s interesting to note that for a period of time, Takemitsu held a certain disdain for Japanese music, saying that it was something he associated with the war, which was of bitter times. The composer was very much interested in composers like Debussy, Mahler, Gershwin and Messiaen. Olivier Messiaen in particular was a figure one could draw distinct parallels from Takemitsu’s own compositions. As a composer, the Frenchman had a fondness for the eastern aesthetic and its sense of time. His Quartet For The End Of Time in particular shares a certain degradation for pulse and metre. In its opening movement Dance Of Fury for Seven Trumpets uses an awkward grouping of sixteenth notes and dotted values and gives “…a frenetic quality in this music that derives from the rapid stream of sixteenth-note beats, which do not group to from larger, even metrical units.”(Koozin, 1993). As well as Messiaen, John Cage was a figure that Takemitsu wished to identify with. In the film Music for the Movie: Toru Takemitsu, one of Takemitsu’s contemporaries Hiroshi Teshigahara noted Cage as an influence, saying, “In America, you had pop-art and radical composers like John Cage. In Japan, we too, wanted to transform things in our own way.”(Teshigahara, 1994). Cage’s piece 4’33” specifically uses silence as an instrumental tool. Cage particularly wanted to see what kind of different silences could be captured and what they contained. This is something one could relate to Takemitsu, and Richie’s quote holds true here, explaining that the silence doesn’t actually exist or is ‘undefined’ until its ‘antithesis’ become prevalent. So in a sense, the capturing of different silences and what they contain is a parallel one could draw between the two composers. It appears though, that no matter how he tried to escape a blend of the two aesthetics, Takemitsu wasn’t quite able to transcend these fields. His orchestration is in a sense western, with the whole strings, percussion, woodwind and brass ensemble, but a lot of his metaphysical and also pitch construction has a tendency to take from his traditional roots. The pitch and sense of silence have a disposition to merge, which then very much so reflect a Japanese cultural taste. In the end, Takemitsu’s goal of transcending a western and eastern aesthetic in favour of a style new and different isn’t necessarily what he achieved. However, intricate pitch construction, rhythmic construction, musical gestures spanning both these aesthetics gives us a piece not only highly defined by its orchestration, but by its metaphysical character too. Using a very Japanese notion of time, timbre and silence portrayed by a western orchestra, the composer has exhibited an extremely deep and exploratory search of fixed musical objects, tonal exploration in a single note and a harmonic series that is free to bounce around an almost non-existent series of values. However, in saying this, Takemitsu was one to say things, and then go about it in a way that is not quite as linear as to what he proposed. His rhythmic series used in the piece seems almost non-existent. Also, the Japanese garden metaphor on which he based his piece and its texture is strongly associated with horizontal texture and the piece as it unfolds over time. However, as a composer influence by traditional Japanese music, like gagaku, the vertical texture is extremely important to the piece as it does have a tendency to explore the timbral range of his orchestra and how that evolves just as much as its horizontal counterpart. Burt, P. 2006, The Music of Toru Takemitsu. Cambridge University Press, New York, USA. (Berkeley: Fallen Leaf Press, 1995), 98. Takemitsu (Berkeley: Fallen Leaf Press, 1995), 109. For me it’s “storm chords” especially as they occur with the brass and winds. The storm is coming and the birds descend into the garden.